In January, President Donald Trump’s senior adviser Kellyanne Conway told CNN in no uncertain terms that her boss would be flouting presidential convention by not releasing his tax returns. On Tuesday night, Rachel Maddow revealed one document — his 1040 from 2005— courtesy of investigative reporter David Cay Johnston which showed that in 2005, he made over $150 million but paid just $38 million in taxes. In the early hours of the evening Tuesday, Maddow tweeted that she had Trump’s tax returns, inciting a minor frenzy. To be clear, they’re from 2005. She had his 1040 from 2005, which isn’t quite as good as we’d hoped, but still better than the fat pile of nothing the White House has offered. Ever the drama queen, MSNBC floated a countdown clock in the corner of Chris Hayes’s broadcast, whipping the American public into a heightened state of justified near-hysteria, chomping at the bit for the big reveal. After twenty solid miuntes of context and lead-in, Maddow finally gave it up. The documents were mailed to journalist David Cay Johnston, who speculated that there was a chance that Trump might have leaked them himself. The Daily Beast published a succinct summary of Johnston’s report, which was originally published on his website DCReports.org. The documents show Trump and his wife Melania paying $5.3 million in regular federal income tax—a rate of less than 4% However, the Trumps paid an additional $31 million in the so-called “alternative minimum tax,” or AMT. Trump has previously called for the elimination of this tax. Johnston also noted that Donald Trump and his wife, Melania, paid the same tax rate as he did. The twist, of course, is that Johnston and his wife made $400,000 a year. The President and his wife earned “$418,000" a day. Donald Trump has remained silent so far, but the White House issued their own statement on this recent revelation. It is as mature and composed as you’d expect. 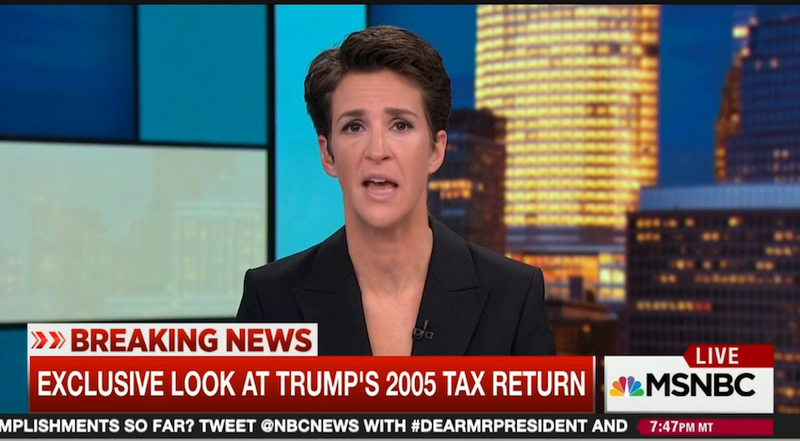 “You know you are desperate for ratings when you are willing to violate the law to push a story about two pages of tax returns from over a decade ago,” it reads, before confirming what the two pages of Trump’s tax returns already did — that he made a lot of money and paid not that much taxes on that money. Update, 10:09 PM: And now, the video. Watch below.